TauroLock® catheter locking solution protects your patient from catheter-associated risks. Containing a combination of Heparin, Taurolodine and low concentrations of Citrate, you no longer have to compromise on patency or infection control. TauroLock® is used to prevent infections in catheter and port systems. Heparin and 4% citrate only have an anticoagulant effect, but no bactericidal properties. Consequently, contamination of the catheter can lead to bacteraemia. Prophylactic use of TauroLock™ prevents the formation of a biofilm and thus improves the patency of the catheter and/or port. 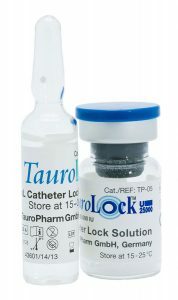 TauroLock™ is the most clinically reviewed catheter locking solution in the market – with over ten years of clinical history, TauroLock meets the requirements set up by the different guidelines in infection prevention as well as uniquely reducing occlusion complications whilst offering a safe alternative to other solutions in the market. TauroLock™-U25.000 contains substances to ensure patency and provide infection control in the device. It is used with a port or a catheter-based vascular access device. TauroLock™-U25.000 is instilled in the device lumen between treatments in order to make the internal flow passages resistant to clot formation and hostile to bacterial and fungal growth.